Myself and my team travel around Europe on a frequent basis, meeting digital agencies and others involved in the advancement of digital marketing capabilities and advertising success. The different growth rates, channels used and local cultures create some very interesting differences – and similarities – between countries. We therefore thought it might be useful for us to share a few of our insights with you, so read on to find out more about our perspective on Spain. 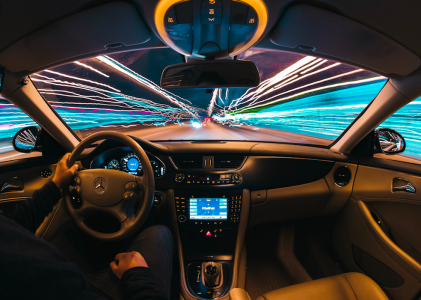 It is a very exciting time to be part of Spain’s digital industry, which is buoyant and full of potential despite the challenges of the country’s economy and the wider eurozone. With its rich digital heritage, relatively early adoption of mobile broadband and amazing innate creativity, Spain has a strong personality and opportunity in the digital world. demographic reports the Association of Research for Media, suggesting a fruitful target market for online advertising. 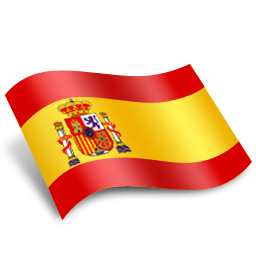 Further growth in Spain is also expected, with eMarketer predicting internet users will rise to over 33.5 million by 2016. While internet penetration is not as strong as some other European markets, such as Germany and France, the popularity of areas such as the mobile web and social networking are particularly notable in the country according to the research company. On this subject, examples such as Tuenti are definitely worth taking a closer look at. The social network has just opened up on a global level, with more languages and iPhone plus Windows Phone apps on their way imminently to go alongside the existing web, Android and Blackberry versions. 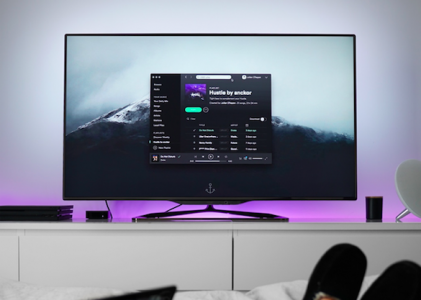 With over 13 million users, 6 million of which are mobile, Tuenti is now pushing to become a truly international offering, which is just a small sign of how much growth there is ahead for the digital industry in Spain, both inside and outside of its country borders. Of course, the internationally dominant players such as Twitter, (4.7% of tweets are now written in the Spanish language) Google, YouTube and Facebook (with around 15 million Spanish users now) are also dominant within Spain, but as with all countries, home-grown channels such as Tuenti are both relevant and prevalent for digital marketing. As a case in point, back in 2009, Business Week reported that Tuenti’s click through rates reached as high as 40%! 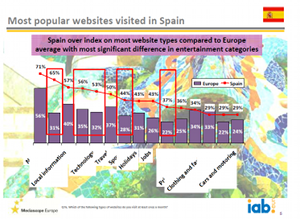 Regarding the types of websites which are popular in Spain, the IAB Europe released a MediaScope research overview earlier this year and while the information relates to 2010, it shows some interesting country-level differences in the type of website visited compared to the rest of Europe. Spanish people have a markedly increased preference towards local, technology and holiday related content, which is good guidance for those advertising brands in these sectors or looking for high traffic media to advertise on. 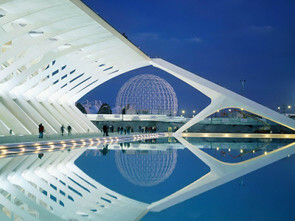 Selling online is an area where Spain is behind other countries in Europe, and therefore an area primed for growth. Ecommerce sales grew 25.7% between 2010 and 2011 according to Spanish Telecoms Regulator CMT and eMarketer predicts an 18.8% leap in 2012, taking the Spanish ecommerce market to $18.57 billion. 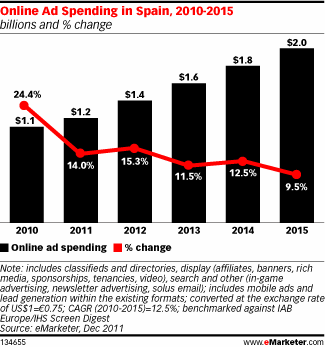 Despite the economic climate, Spain’s online ad spend continues to grow strongly, with advertising spend on digital media accounting for €799 million in 2011 according to the IAB, while the eMarketer graphic below shows strong, but relatively slower growth to 2015, ultimately doubling online ad spend from $1 to $2 billion over a five-year period. All of these factors and more indicate that Spain is still a buoyant market, and an important location for online advertisers looking for new markets. We are enjoying getting to know better the key players, channels and techniques in the region and know that our performance-based focus is a vital cog in the wheel for an industry that is unfairly challenged by wider economicissues. 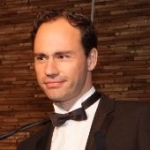 The ability for performance media to deliver results while vastly reducing the associated commercial risk is one of the reasons that search engine advertising in Spain, similarly to the rest of the world, is the dominant channel, with 46% of 2011 online ad spend (IAB Europe ADEX, 2011). 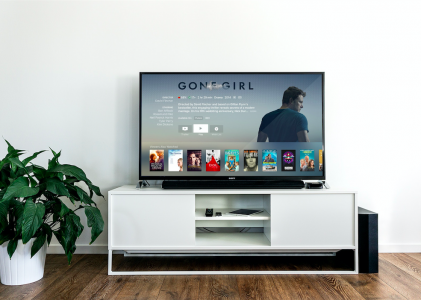 As the Spanish online advertising industry continues its necessary evolution towards success, rather than impression-based models, the advertisers’ ability to deliver ads across all relevant channels is going to help Spanish digital agencies lead their country forwards.